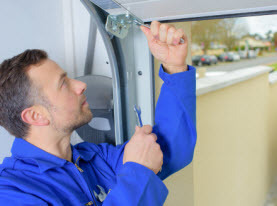 Vegas Valley Garage Door Repair of Las Vegas, Nevada is readily available to provide professional expertise to the commercial and residential properties locally and in surrounding areas. Being fully licensed, certified, and insured has given us the opportunity to deliver quality workmanship along with traditional values and friendly customer service. Our technicians are among the elite; having the technical and safety training, experience, and skills to perform all the services we offer with the aid of high-end products and equipment Swift Garage Doors can ensure quality results. 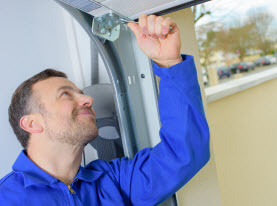 Vegas Valley Garage Door Repair offers our customers a number of services in the Greater Las Vegas, NV area, including online customer service. For your convenience, we have compiled a glossary related to the garage door industry in an effort to help have a clearer understanding of the terms frequently used. Back Hangs: Vertical supports that hold the horizontal track in place that ensures the door is in proper alignment within the track. Backroom: The amount of space that is required to install a garage door, which measures from the door to the back of the horizontal track. Bottom Bracket: Also known as corner brackets, garage doors feature 2 bottom brackets located on both the right and left side; typically found attached to the lifting cables on most sectional doors. Cable drums: Essential to a tension spring system, the cable drum keeps the lifting cable in line to prevent tangling while the garage door opens as it winds around the grooves. 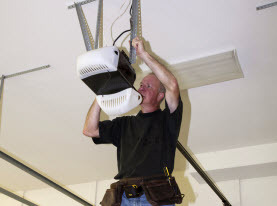 Cable Safety Device: A device that prevents the garage door from falling in the event the cable breaks. Cable Stop: Attached to the end of the cable, it is designed to stop it from slipping through the drum. Cable: Also referred to as a lifting cable, connects the bottom bracket to the counterbalance mechanism. Center Hinge: A flat hinge mounted on the door section which allows it to maneuver the curve between the horizontal and vertical tracks. Center Support Bearing: Mounted above and to the middle of the door, this is designed to support the spring shaft. Cycle: A cycle is a completely closed garage door that is fully opened, and returned back to being completely. This term is often heard in conjunction to the torsion spring rating which is determined by how many cycles they’re supposed to safely complete in their lifetime; generally reaching 25,000, 50,000 or 100,000 cycles. Door Frame: The door frame holds the garage door with two vertical side pieces and a horizontal header or top piece. Door Movement: Door movement classifications are; standard lift, full vertical lift, high lift, or low headroom and it references how much room a door has to lift in relation to the inside measurements of the garage. Door Size: The measurements that correspond with a garage door size; the measurements are given width first, followed by the height. Extension Springs: Extension springs stretch on either side of the door, running from a pulley attached to the door, to the rear track hanger and is of one of the two types of spring systems designed to carry the weight of a garage door when it lifts. Flag Bracket: Hardware that connects the vertical and horizontal tracks. Garage Door Opener: Usually operated automatically by remote control, the garage door openers includes all of the hardware, electrical, and mechanical elements that works together to open and close a garage door. Gauge: Gauge is the thickness of steel; the higher the number, the thinner the steel. 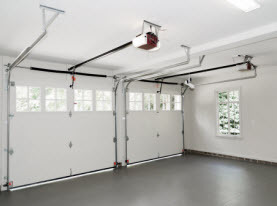 Hinges: Allowing the door to conform as it runs up the vertical track and onto the horizontal track, the hinges are used to connect the sections of a garage door. Horizontal Track: The track that runs parallel to the garage ceiling; in place to support and guide the door to reach its completely opened position. Insulation: Made of polystyrene foam or polyurethane filler; polyurethane insulates better than polystyrene, however the polystyrene lasts longer, the insulation helps keep outside temperatures out and inside temperatures in. Jamb Seal: The jamb seal is the weather-stripping that runs around the door jamb, which is designed t0 prevent drafts, rain, and pests from entering the garage. Jambs: Vertical pieces on both sides of a door frame. Lift-Handle: A piece of hardware generally installed on manually operated garage doors. Low Headroom: A special low-headroom track hardware accessory required when garage ceilings are lower than the standard. Opening Size: The distance between the walls and the doorjambs in the garage door opening. Overhead Garage Door: A door built in hinged sections that permits it to travel up and down the tracks as it opens and closes. Pane: A single section of a door. Photo-Electric Sensor: A safety requirement enforced by law; these sensors are mounted 6” above the ground in the doorway, and will reverse the direction of the door if it hits an obstruction. An added feature is if the sensor fails, the door will not be operational. Rear Track Hangers: Designed to attach to the horizontal track to the ceiling, these hangers contribute to stabilizing it. Rollers: The wheel part of the roller assembly that rolls freely using ball-bearings. Sectional Doors: Doors made up of sections that are hinged together to allow it to bend around the track as it opens and closes. Shaft Bearings: In place to support the weight of the counterbalance system against the weight of the door. Spring Assembly: Hardware that transfers the weight of the door to the counterbalance system. Top Header Seal: The weather-stripping that runs along the top of the garage door. Torsion Springs: Mounted above the door, and are loosened and tightened by the cables as they wind around the drum when the door is opened and closed. Torsion springs are the other type of spring system that contributes in raising and lowering a garage door. Track: Running vertically to the top of the garage door, then horizontally parallel to the ceiling, the tracks are a part that holds and guides the roller assembly. Winding Sleeves: Hardware that converts the tension as it enters the tension springs to distribute it into a manageable weight for the spring system. If you have a question not addressed above, know that Vegas Valley Garage Door Repair has the answers. Contact Vegas Valley Garage Door Repair for all your garage door needs.